What is the Best Fermented Cod Liver Oil Flavor for Children? It’s a great choice to give your children Blue Ice Fermented Cod Liver Oil from a very young age, beginning usually around 6 months. When a baby is still breast feeding or using a bottle, it is easiest to give them Blue Ice Fermented Cod Liver Oil by Green Pasture in the Cinnamon Tingle or the Oslo Orange flavor. The Cinnamon Tingle is a strong cinnamon flavor and can sometimes be considered spicy. The Oslo Orange flavor is not spicy but is not as strong in flavor and doesn’t mask the fishy flavor as well. It comes with a syringe. Starting with just a small amount of Blue Ice Fermented Cod Liver Oil, 1 ml or less, put the syringe in the baby’s mouth and squirt it in. Immediately follow the squirt with either the breast or a bottle. Gradually work up to a dose of 2 ml for a baby younger than 1 year old, the dosage recommended by the Weston A Price Foundation. 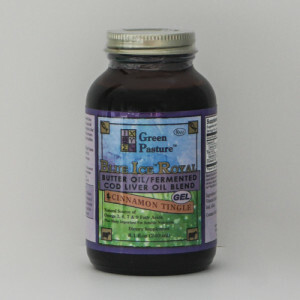 Once your child is old enough to eat off of a spoon with ease, it is recommended that they switch to Blue Ice Royal Butter Oil and Fermented Cod Liver Oil blend, also from Green Pasture. Blue Ice Royal comes in multiple flavors and it will take experimenting to find the flavor right for you. For children, we strongly recommend that you try either the Cinnamon Tingle or the Chocolate Cream. 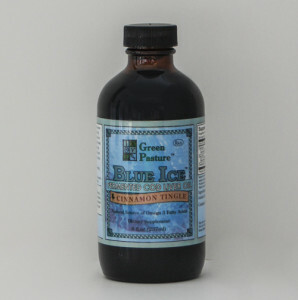 The Cinnamon Tingle Blue Ice Royal Butter Oil and Fermented Cod Liver Oil is a strong cinnamon, similar to that of Big Red gum. It does have a small amount of stevia in it for sweetness. The Chocolate Cream does not have any sweetness in it and wouldn’t be considered spicy. The Chocolate Cream Blue Ice Royal can be sweetened with a drop of honey if needed.